Is it the budget? Or just good ol fashioned activism that brings us this good news? - We're going with activism. Your mobilization is working, but there's still more work to do! Earlier today word got around that ICE was releasing a significant number of immigrant detainees from detention centers across the country. Well now there's some confirmation, of course with a little bit of spin. ICE is claiming the buzz word "sequestration" but we all know ICE has plenty of dough, in fact the feds spend more on immigration enforcement than on any other federal enforcement. Check out an excerpt from the Huff Po report below or read the whole thing here. 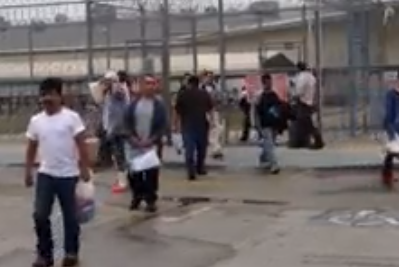 WASHINGTON -- Immigration and Customs Enforcement released some people from immigrant detention facilities across the country on Monday in response to looming federal budget cuts. "In order to make the best use of our limited detention resources in the current fiscal climate and to manage our detention population under current congressionally mandated levels, ICE has directed field offices to review the detained population to ensure it is in line with available funding," agency spokeswoman Gillian Christensen said in a statement. ICE and the Department of Homeland Security are analyzing spending as congressional inaction increases the likelihood of so-called budget sequestration -- across-the-board spending cuts that begin on March 1. Detaining immigrants is an expensive business, with an average daily cost of $122 to $164 per person, according to the American Civil Liberties Union. Alternatives, including ankle bracelets and parole, are far cheaper. Christensen declined to say how many undocumented immigrants were freed on Monday or to give their locations. She said they have been "placed on an appropriate, more cost-effective form of supervised release." ICE did not drop the cases against the individuals and will still deport them if ordered by an immigration judge, she said.